In today's edition of Loose Threads, I've got jersey news, ice painting news, and some other stuff. I always know to start with the jersey news and for now that means Calgary. Flames retro Edge jerseyAn Icethetics reader sent in a photo of the Calgary Flames vintage sweater in its new Reebok Edge cut. Last season, the Flames re-introduced their original threads as an alternate uniform as part of their 30th anniversary celebration. Then in March the team announced that the classic sweater would be back for at least another season, but as a Reebok Edge jersey. Last season's version was made out of the standard pre-Edge jersey material. The design remains mostly the same but for an alteration in the collar. The Flames have said this jersey will be worn up to 15 times this season. Last year, it saw action in only five games. Thanks to Mitchell for sending in this photo. Leafs paint new patriotic center lineThe Toronto Maple Leafs have overhauled their center ice design at the Air Canada Centre. A string of Canadian flags now forms the center red line on their rink. But there's a twist. The leaf you find within those little white boxes that run the 85 feet from dasher to dasher is not quite what you'd find on the flag. It's actually the Maple Leafs' logo painted red. Not ground-breaking, but pretty cool. Close-up of Leafs' new red lineHere's a close up. But if these photos aren't enough for you, the Leafs have you covered. There's an entire photo gallery on the website that shows the process of painting the logos before the ice goes down. Thanks to Brad for that. Also, I haven't yet mentioned it on the site, but I did link to it on Twitter last week. 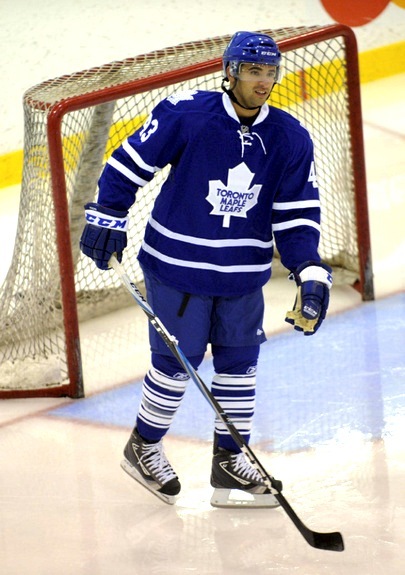 We recently got a look at the the Leafs' new home sweater in action at the NHLPA Rookie Showcase. Click here to see it. Kings to celebrate Legends NightFinally, we have some new details on what the Los Angeles Kings are calling Legends Night this season. Icethetics reader Curtis S. recently received his season ticket package and had some information to share. He says the Kings have branded several games as Legends Night. Not sure what that means but the games are denoted by an emblem that features the Kings' retro logo. The team will be wearing a retro sweater this season, so this is probably indicative of that. We already know the Kings will relaunch the classic threads on Oct. 9 against the Canucks. Curtis tells me that other Legends Nights include Jan. 15 vs Edmonton, Feb. 24 vs Minnesota and Mar. 19 vs Anaheim. Too bad those games are all at home. What a sight it would be to see the Kings and Oilers both in their brightly-colored retro sweaters — no red, black or navy blue to be found. 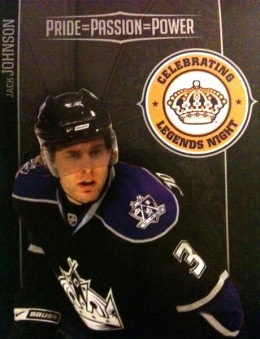 By the way, the Kings are holding Hockey Fest '10 this Saturday. They haven't said anything about unveiling their retro jersey at this event, but it would be a good time, so I'll keep an eye on it.